What is an Eustachian Tube? The Eustachian tube is a narrow tube connecting the back of the nose and the middle ear. Normally, the tube is filled with air and opens when we yawn, swallow or chew. It functions to protect the middle ear from pathogens; to ventilate the middle ear, which allows the eardrum to work and vibrate properly; and, to help drain mucus from the middle ear. Chronic blockage of the Eustachian tube is called Eustachian Tube Dysfunction (ETD). This can occur from inflammation of the mucous membranes from allergies or a sinus, nose or ear infection, or excessive lymphoid tissue around the tube. In some cases, the Eustachian tube just does not open or close properly. Young children (especially ages 1 to 6 years) are at particular risk because they have very narrow Eustachian tubes. Also, enlarged adenoids can block the opening of the Eustachian tube. 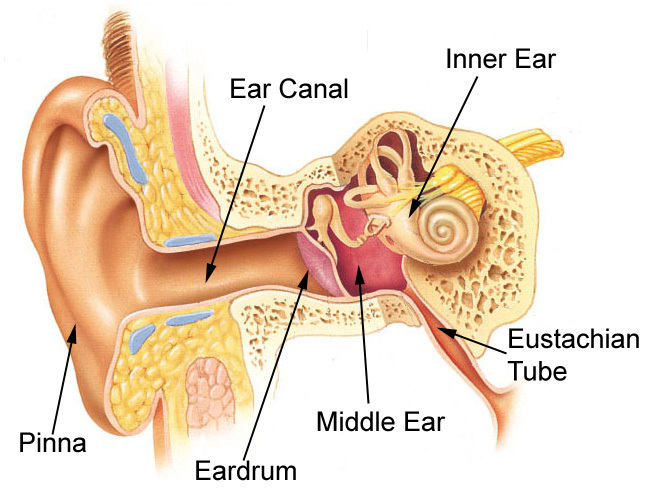 Blockage of the Eustachian tube causes the lining of the middle ear to absorb the trapped air. This creates a negative pressure that pulls the eardrum inward. When this occurs, people may experience muffled hearing, pain, tinnitus, reduced hearing, pressure, or problems with balance. Long-term ETD has been associated with damage to the middle ear and the eardrum from fluid buildup. If bacteria contaminates this fluid, a middle ear infection occurs. If chronic ETD remains untreated, it can lead to hearing loss. Blocked Eustachian tubes can be relieved by nasal sprays, decongestants and antihistamines, which reduce inflammation and congestion. Medications or shots that treat allergies may also help. People can also relieve pressure by pinching their noses and "popping their ears," although this is not recommended if a cold or sinus infection is present because it can drive mucus into the middle ear and cause an ear infection. Recurrent Eustachian Tube Dysfunction requires the surgical placement of ear tubes, which allow pressure to equalize in the middle ear. If you have experienced symptoms of ETD, contact our office or consult with your physician.